Did you know that there is an entire MONTH dedicated to crafting? Well, there is, and it’s March! In honor of National Craft Month, we’re bringing you 4 new crafts this month- WHAT?! Four. New. Crafts. We’ll be airing our new crafts each week, and the best news is–all of these crafts are walk-in friendly. You won’t need to wait three whole agonizingly craftless days to get your hands on these beauties! On Friday, March 1, we revealed our first National Craft Month addition: Alcohol Ink Coasters. These bad boys have been blowing up all over the internet in different forms, and Hobby Prodigy has been itching to get them on our menu. We promised way back in January when we discontinued our old coasters that we would be bringing you something new, and we hope the wait was worth it–we think so! In honor of our colorful new rock stars, we are giving you a pretty definitive list of the coolest techniques out there for creating alcohol ink masterpieces. We’ve scoured Pinterest and racked our brains for the best tools and tips to make sure that your Prodigy creation is every bit as perfect as you are, so don’t be scared to dive in to this new craft. We’ve got you covered! Less. Is. More. Alcohol Inks go a long way because they have super concentrated colors. Start small and then add colors. Don’t start by placing a ton of color and spots everywhere on your tile. Work with one color at a time and be deliberate with your colors. If you want to make an abstract piece, you can still work slowly to ensure that you’re getting great colors and effects. Wear gloves. These inks are potent! They will absolutely stain your hands and your clothes, so please use all of the protective gear provided. Inks Blend. Remember that you’re working with a constantly wet medium, so your colors will blend with each other. Try to use colors that will either blend nicely or complement each other. Remember- too many colors will create brown. No one wants that. Have Fun! Ink has a mind of it’s own. Don’t try to control it too much or you will get frustrated quickly. Have fun with the process and let it take shape naturally. Tilt Method: Our instruction tutorial is great for showing the tilt method. 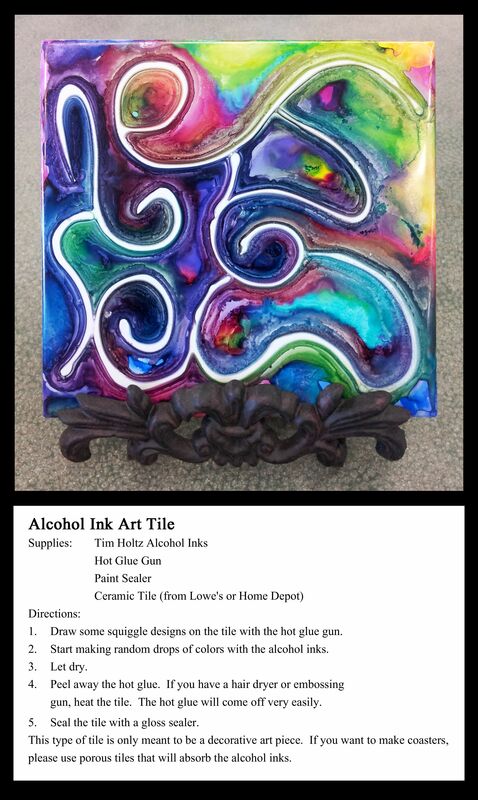 Simply drop dots of alcohol ink and alcohol on the tile and tilt. This method will create a drag effect similar to what you’d see on an acrylic pour. manipulate the ink if you are working on an intricate piece. Straw Method: Many people use canned air for this method, but because we are an ECO-friendly company, we are using human powered air. Blowing against a spot of ink creates a splatter pattern like none other. You can use this method for fireworks, flowers, abstract styles, and so much more. Just don’t inhale in the alcohol spray off. Please. You’ll be sneezing colorful for a week. Freestyle: Just use the alcohol ink dropper and go crazy. This will give you big spots in your design and can easily be spread using the above methods. Flick Brush: Dip a slightly bigger brush in alcohol and tap it off (you don’t want the brush to be soaked). Using your finger, quickly brush along the edge of the brush to create a spray of droplets on your design. The drops will vary in size and land in many different places. Be sure to keep your alcohol inside the provided tray. Air Brush: Fill your dropped with alcohol and squeeze it all back out into the bottle. Only a little alcohol will remain in the dropper. Then you can hold it over your piece and squeeze the dropper hard several times. Excess alcohol will spray from the tip providing a similar effect as the Flick Brush. Ink On Ink: Use the ANY of the above methods with ink instead of alcohol to create colorful dots in your masterpiece. Check out these $5 add-ons to make make your coasters POP! Ask your Pedagogue about these options at your reservation! Hot Glue: Use hot glue to create a pattern on your coaster prior to inking. Once your ink is completely dry, remove the hot glue to reveal your pattern. Vinyl: (Walk-in availability only) Add a vinyl silhouette to your coaster before inking. Remove the vinyl once the ink is completely dry to reveal your design. Glitter: Nothing beats glitter. Ever. Period. Decorate the sides of your coasters with some glitter from our buffet to really finish this project with some class and style. Paint: Use paint to create a cohesive edge on your coasters. This entry was posted in Uncategorized on March 5, 2019 by hobbyprodigy. This is Abby, Director of Operations for Hobby Prodigy, and I have some great stuff to share with you today! In the middle of January, Jenn and I hopped on a plane to Phoenix, AZ to spend the weekend at the largest crafting show in America. Needless to say, we were in heaven. At the show we found a bunch of new product to share with our customers (no spoilers #sorrynotsorry! ), but not every product we found can work for Hobby Prodigy. My favorite new hobby that grew out of this trip was crocheting, and I have been #hooked (sorry, bad pun) ever since. For the last two and a half weeks, I have been slowly teaching myself how to crochet and seeking out the best possible tutorials on the internet. I have also found some great resources for free crochet patterns- namely amigurumi patterns, so keep reading and find out for yourself how much fun this craft can be! Amigurumi is the craft of making little crochet or knit animals and creatures! It started in Japan, and it has made huge headway over the years. Most Amigurumi patterns start with ball-like forms which then have heads, arms, legs, tails, etc. sewn on, and while they look difficult and intricate, I can now tell you with full confidence that making these adorable stuffed animals is easy if you have a little patience! This is the second Nora I made using the Hooked Kit. My second attempt turned out a LOT better than the first! The first step to learning to crochet is getting supplies. I started my crochet journey with a kit from Hooked. We met the Hooked team on our second day at the show, and we picked up some samples of their incredible 100% recycled yarns, a sustainable bamboo crochet hook, and our first amigurumi kit: a unicorn pattern called Nora. (NOTE: The Nora kit is not yet available on Hooked’s website, but the pattern is linked. The website tells you exactly which yarns and needle to pick up from their a la cart yarns.) I fell in love with the full line of Hooked products instantly, and as a green company, Hobby Prodigy loves that Hooked is committed to using recycled and sustainable materials to ensure that crafters can enjoy quality materials for generations to come. The nice thing about the amigurumi kits from Hooked is that they contain all of the yarn you need to complete the pattern plus the correct size crochet hook and the pattern. This makes them ideal for first timers, and it minimizes the supplies you will need to purchase to get started. You will still need to pick up fiber fill to stuff your creation, and I recommend picking up a yarn needle. Both of these can be purchased at any craft store or Walmart for just a few dollars. For a full list of the animal kits offered by Hooked, check HERE. How do I…yah know…do it? How to Hold Your Yarn and Needle: I found this tutorial very helpful for getting started. Since then, I have developed by own method because I like to hold my needle like a pen rather than a knife. Once you’ve learned the basics, feel free to change it to do whatever is most comfortable for you. How to Make a Chain: This is a bit long, but it is worth it. This will show you how to make a slip knot and start a chain. in the round. This is important for amigurumi and is just slightly different from single crochet for chains. You can also check out this slow motion tutorial. This was my first attempt at Amigurumi using the Nora kit by Hooked. The legs were a bunch of different sizes and it was lopsided! Magic Ring: This is an amigurumi technique to start a round crochet without a hole in the middle. How to Switch Colors: This will allow to you to create stripes and other effects without needed to sew two pieces together. These tutorials should help to get you started, so be patient and practice! My first piece was only 7 inches tall but took me over 10 hours to complete. I highly recommend checking out https://jesshuff.com/ for patterns and tutorials to start your Amigurumi journey. I got my Freric the Fox pattern from this website and learned a lot of great skills from the embedded tutorials. Fredic the Fox halfway done featuring my fox mug! This entry was posted in Uncategorized on February 4, 2019 by hobbyprodigy.